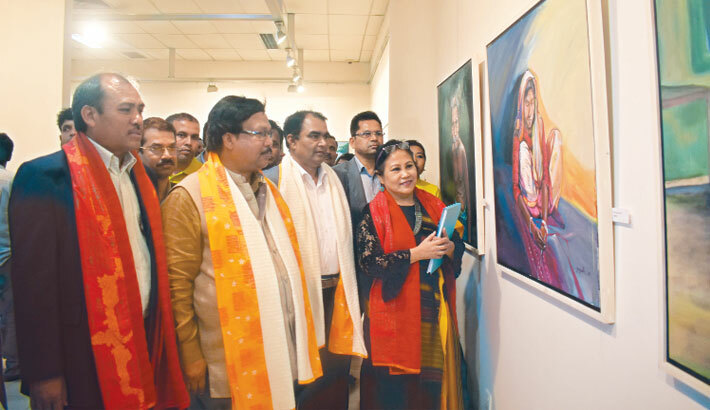 An eleven-day long art exhibition titled ‘Portrayal of the Cultural Lives of 50 Ethnic Minorities’ is underway at Gallery-1 of National Art Plaza of Bangladesh Shilpakala Academy (BSA) in the capital’s Segun Bagicha area. The inauguration ceremony of the exhibition was held at BSA on Tuesday at 4 pm. The opening event was presided over by BSA director general Liaquat Ali Lucky while Additional Secretary of Cultural Affairs Ministry Md. Nizam Uddin, Bangladesh Adivasi Forum general secretary Sanjib Drang and artiste Kanak Chanpa Chakma were also present as special guests on the occasion, among others. The exhibition will continue till March 15 and it will remain open for all from 11am to 8pm every day and form 3 to 8pm on Fridays.